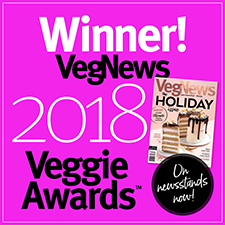 What could be better than getting more veggies in your diet while snacking on delicious, crunchy treats? 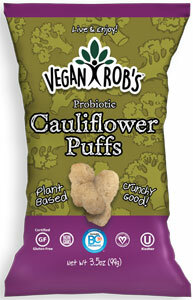 Well, Vegan Rob's has changed the snacking game forever with their delicious Cauliflower Puffs! Made with simple organic and non-GMO ingredients to give you the best nutrition when you snack, these delicious puffs combine real cauliflower powder with the perfect balance of spices for a treat that's addicting and good for you! To make this snack even more unique, each serving contains a dose of vegan probiotics to help aid in digestion and proper gut health - something not normally found in snack foods, especially not ones this tasty. 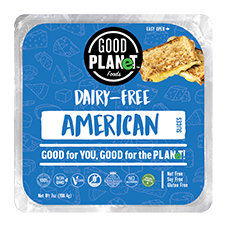 Not only that, they're gluten-free, kosher certified, and have only 1g of sugars, making this the perfect choice for vegans who are conscious about their health as well as flavor! 3.5 oz. (99g) bags are $2.99 each. From Anonymous of Lindsay, Ontario on 5/10/2018 . From xForTheAnimalsx of Boston , Massachusetts on 7/13/2017 . These are probably the best puff I have ever had. They kinda taste like funyuns (that is a great thing).